With Burnley’s future in the Premier League hanging in the balance, teenage winger Dwight McNeil has outlined just how crucial the club’s remaining fixtures are. The Clarets, level on points with Southampton, are just two points ahead of relegation-threatened Cardiff City having played a game more. 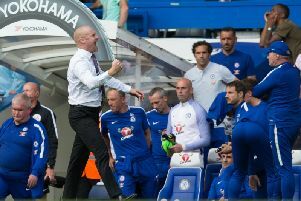 On the back of a record-breaking eight-game unbeaten run at this level, Sean Dyche’s side have now slipped up in their previous four outings and are staring down the barrel of a second return to the Championship under his tenure. McNeil, 19, who featured for England’s Under 20s against Poland and Portugal during the international break, isn’t willing to give up his dream of playing in the top flight and can’t wait to put things right against Wolves at Turf Moor. “They’re massive games, all seven games are massive now,” he said. “The ones at home are the ones we’ve really got to try and take advantage of. “All the games coming up are really big for us, no matter who we’re playing against, but we’ve got to take them one at a time. “Everyone is disappointed but we’re all in it together and we all want to stay in the Premier League. That’s the aim. “It’s a big game against Wolves. McNeil earned his second England Under 20 cap on Tuesday night as Paul Simpson’s side lost 1-0 to Portugal in Penafiel. England U20s slipped to a narrow defeat against Portugal in Penafiel on Tuesday evening. The Young Lions competed well against opponents rated as one of the favourites for this summer’s Under 20 World Cup in Poland, and went in goal-less at half-time. But a second-half goal from Pedro Correia after a defensive mix-up handed Portugal the victory. McNeil was a 65th-minute substitute for Belgian side OH Leaven’s George Hirst – son of David, having played all 90 minutes in the 3-1 win over Poland last Thursday.